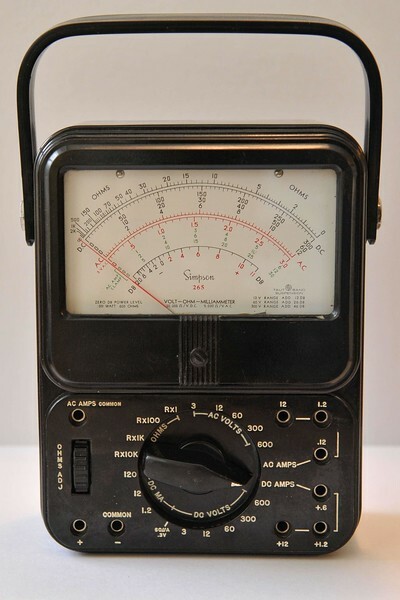 Antique Radio Forums • View topic - Simpson meter 265 good or? Simpson meter 265 good or? Post subject: Simpson meter 265 good or? Hello all, I have the chance to buy a Simpson 265 meter. I had never known that it even existed before. So what is the difference between the 260 and the 265? I could not find much out on the net. I was surprised. I have a "normal" Simpson 260, a 260 7M I believe. Works great. Or should I wait and try to find a Trippliet 630? I hear that those meter are great also. Post subject: Re: Simpson meter 265 good or? 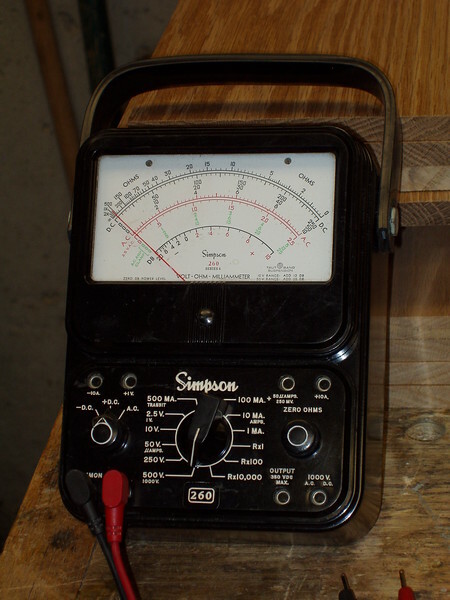 The Simpson is a pretty nice looking meter and a bit different than the straight 260s. Looks like they've eliminated the AC/DC+/- switch, and it's all in the range switch now. Decent upgrade I'd say. I just live vintage test equipment for some reason, I have a good DMM but want a good analog meter as well, true I have a 260 but hey, if the price is right....why not? ... if the price is right....why not? That’s always been my motto, but it’s gotten me into SOooo much trouble. About what years was Simpson 265 offered, new from their distributors/ ad sheets/ or catalogs? I ask because the inside photos you've linked to look alot like the original Triplett 630, earliest (Red-Dot) production (about 1948 thru early-1952) bakelite, vertical resistor turret holder. You might want to buy it, just to have it (because it's so different), if it's the right price. At least the 260 can be calibrated and presume the 265 can too. I have an old 630 Triplett with the turret. There is no alignment, they just depend on the resistors holding value to maintain original tolerance. Mine was off a little because the 55k resistor had only changed to 56.4 K or something. I padded it with a 2.2M resistor to bring it back on and that brought back the accuracy on the lower voltage ranges but for HV it is still reading a little low because the divider resistors for those ranges are like, 4.8M, and 9M values. What gigantic value do you use to pad those a couple percent? And try to find those resistors in maybe 1% for replacement, good luck. Most of those top meters have a good rep, the only drawback is if they were mistreated or have battery leakage or something. Or resistor drift. Basic quality is superb for their time. One thing you didn't notice, or at least you didn't mention it, is that the scales of the 265 are the same as you find on the Triplett 630, and not the 260. These were made by Bach-Simpson in Canada. AC current transformer and Bakelite resistor turret construction inside, very similar to the Bach-Simpson 635HV they made for the Canadian military, and the KS-14510 made for the Bell System, but unlike the Bell System meter, it uses common batteries.